People tend to validate their decisions, emphasizing pros and downplaying cons. People believe that since they made a decision in the first place, it must have been the correct one. This bias underpins the popular initial objection of “I’m happy with what I have”, especially if the prospect has been a long-standing client of their existing vendor. It is difficult to express that your prospect may not be 100% correct with their understanding of why they’re happy or whether they made the correct decision. 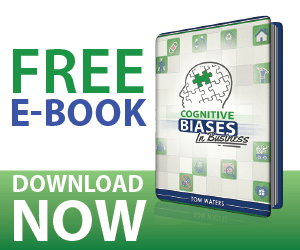 Recognizing this bias is the first step toward building an appropriate rebuttal response during the qualifying stage of a solicitation. Once validated, follow through with the importance of exploring options at least occassionally to keep their business healthy and optimal and to keep their existing vendors honest. I know you’re happy with what you have. Every one of my clients were happy with what they had. I’m just looking to make sure you are familiar with all of your available options. Most of the time, my clients learned of considerable improvements that they didn’t realize they could be taking advantage of. Mather, M.; Johnson, M.K. (2000). “Choice-supportive source monitoring: Do our decisions seem better to us as we age?” (PDF). Psychology and Aging.